Synthetic peptide corresponding to Human PIP4K2 beta (C terminal) conjugated to keyhole limpet haemocyanin. 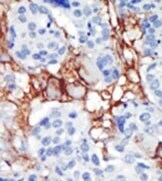 Human breast carcinoma, human hepatocarcinoma and NCI-H460 cell lysates (WB). This antibody is eluted out with both high and low pH buffers and neutralized immediately after elution then followed by dialysis against PBS. Our Abpromise guarantee covers the use of ab37794 in the following tested applications. WB 1/100 - 1/500. Detects a band of approximately 47 kDa (predicted molecular weight: 47 kDa). Participates in the biosynthesis of phosphatidylinositol-4,5-bisphosphate. Highly expressed in brain, heart, pancreas, skeletal muscle and kidney. Detected at lower levels in placenta, lung and liver. Endoplasmic reticulum membrane. Cell membrane. Associated with the plasma membrane and the endoplasmic reticulum. Formalin-fixed and paraffin embedded human breast carcinoma tissue stained with ab37794 followed by AEC staining. ab37794 at a 1/50 dilution. Additional bands at: 100 kDa, 75 kDa. We are unsure as to the identity of these extra bands. ab37794 has not yet been referenced specifically in any publications. Publishing research using ab37794? Please let us know so that we can cite the reference in this datasheet. There are currently no Customer reviews or Questions for ab37794.